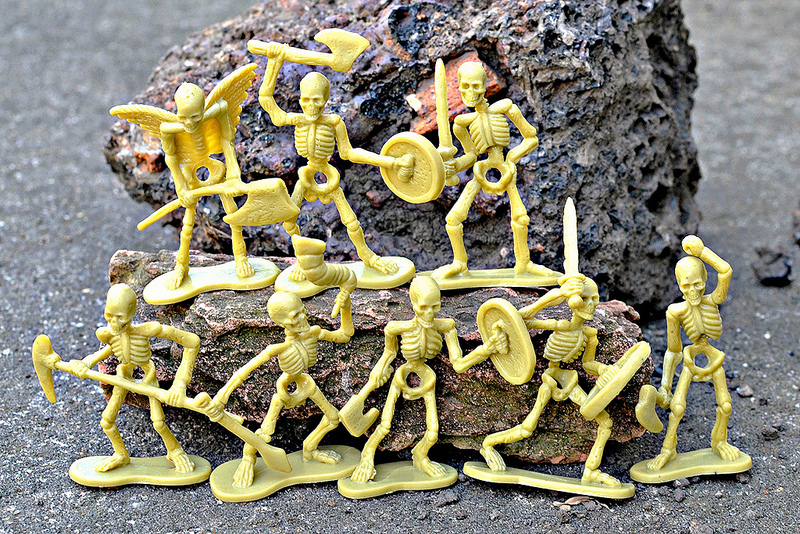 In the past I've posted about the excellent Polotoy skeleton warrior fantasy figures, but there's so many other toy solider-style skeletons out there that I figured it was time for another entry featuring some additional sets. Why have there been so many different varieties of these bony baddies produced? Who knows, but I'm not complaining! 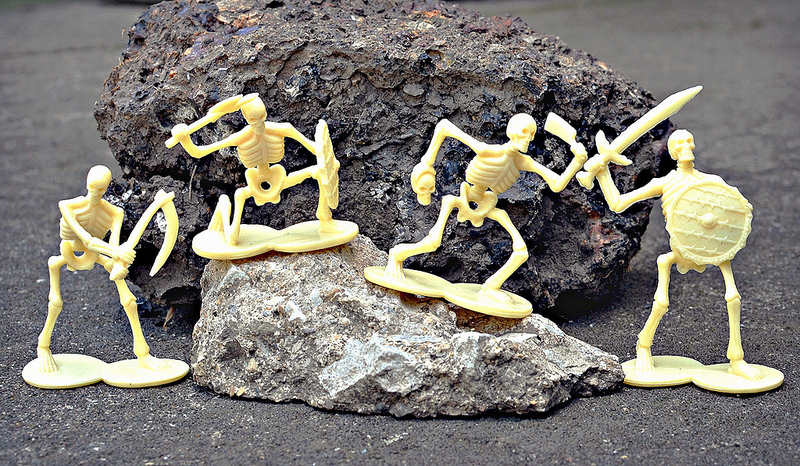 A little little plastic reanimated skeleton holding a sword, shield, or axe never gets old. The three sets featured below are all relatively recent releases. First up we've got a set that has been sold (and at the time of writing this, is still being sold), in big bags by Oriental Trading Co. I love the sculpts on these guys, including how random a couple are -- like the one with wings and the one with what I think is a shell horn. As shown on the Fantasy Toy Soldiers blog, these same sculpts were previously sold in different colors in different packaging as Skeleton Soldiers and Skull Knights. These Oriental Trading versions are made of a pretty pliable plastic that feels nice but unfortunately leads to many of the figures getting bent while pressed together in their packaging. This can be fixed by putting them in boiling water for a few seconds immediately followed by a bath in ice cold water. I got these blood red beauties in a trade with Mason of the DI Treasures blog a while back, who found them at Family Dollar as part of a pirate playset tub (you can see his post on them here). Thanks again to Fantasy Toy Soliders, I learned that they seem to be bootlegs of earlier "Tomb Warrior" figures by Toy Major. These are made of light, hard plastic. There's some fun sculpts here, including a skeleton with a hook hand and another with its mouth agape that looks to be either really happy or really angry. Finally, here are some skeletons that I believe were just released for the first time last year (I could be wrong, but I had never seen them before that). I found them at Party City, where they were available around Halloween as party favors. 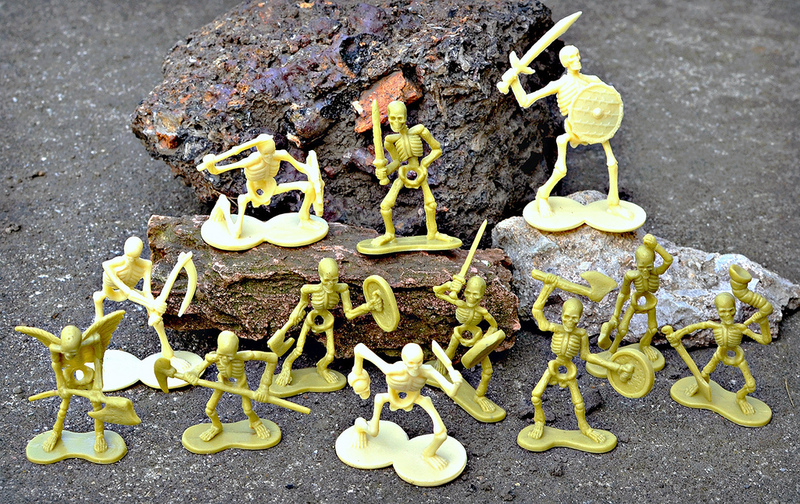 They came in a bag of 16 with a header card that said "Skeleton Figurines" and included Amscan as the company name. There's only four different sculpts, but they make up for it in nice detail and overall coolness. I especially like the skeleton that's holding a cleaver in one hand and another skeleton's head in the other! 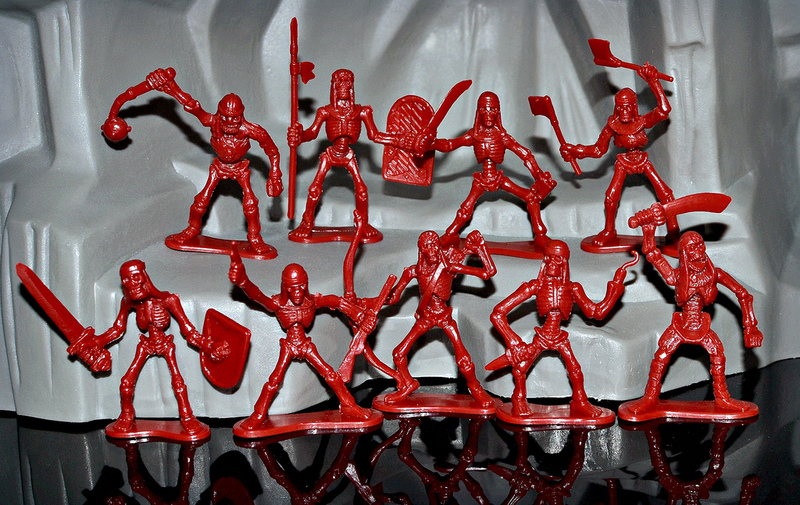 And there we have it -- just a few more of the skeleton warrior sets floating around out there in the world of weird and obscure toys. Which ones are your favorites? Have you seen any other cool skeleton warrior sets to report? Hey, I picked up a set of the Oriental Trading Company skeletons many many years ago (before I got married, which was 10 years ago) in an accessories boutique in Japan. I didn't keep the packaging, so I don't know what name they were sold under. I've used them for RPG games from time to time, but they don't stand up well. I usually have to tape coins or washers to them to keep them upright. If anyone bumps the table, they tend to fall over. But I do like the interesting sculpts and the general weirdness of them. My set are the black with silver highlights style, by the way. Cool. Will they not stand well because they're bent? If so, maybe try to boiling water to ice water method and see if it straightens them out. Some are bent, some are not. None of them stand well on a battle-mat or when jostled, except with the coins taped to the bases. I'm mostly playing RPGs online these days, so the minis are stuffed away in a box. When I start gaming face-to-face again, I'll try the boiling/cold water trick and see if it helps. Cool post! Scale-wise, how well do you think they'd all mix? Thanks! The sizes for these are all a bit different. The Amscan ones are the tallest, followed by the Oriental Trading ones, and then the red ones. So they'd look a bit off all together if you were going to set up a diorama with them. No bones about it, they are some of the best specimens of skeletons I have ever seen. I love the winged skeleton warrior! I'm glad you have enjoyed the red skellies. I can't think of a better home for them. Also, it's nice to finally have a little more info on them. It's not easy sorting out all the bootleg brands, great sleuthing! Thanks Mason! Happy to have them in my collection. Most poses from the top 2 pictures available now (Sept 2017) at Dollar General, 10 figs, 8 poses, $1. In seasonal (Halloween) aisle.